Dual-citizen Carlos and his free-spirited brother Felix both love food. So when a night spent eating their way across Mexico City ends in a tragedy that leaves Felix dead and Carlos grieving, the only thing to do is drop everything and head to a restaurant in Washington state where Felix dreamed of eating. What starts as a desperate adventure turns into the chance at a new life when Carlos somehow lands a job at the restaurant—something his parents would hate, but Felix would love. Suddenly life seems good again, until Carlos is faced with choosing between his passion for cooking and a chance at a relationship. 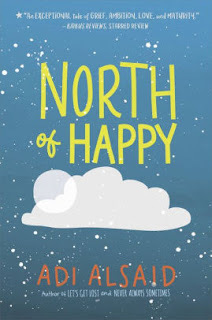 North of Happy is a smart, engaging read that’ll leave you mouthwateringly hungry and eager to try all the recipes Alsaid has thoughtfully included.